Notre-Dame's spectacular Gothic spire collapsed as fire engulfed the cathedral. INTERNATIONAL NEWS - Investigators were working Tuesday to identify the source of a massive blaze that devastated the Notre-Dame cathedral in Paris, as church officials inspected the damage from a disaster that has sent shockwaves through France and the world. Donations and offers of help began to pour in on Tuesday as day broke over the City of Light, revealing the extent of the damage from Monday night's inferno which took around 15 hours to extinguish. "All night long I saw men going past with tears in their eyes. I described it this way: It was total chaos, but we can't let it knock us down," said Philippe Marsset, the vicar general of Notre-Dame. French President Emmanuel Macron had also struck a defiant tone on Monday night as he visited the scene with his wife Brigitte, telling reporters: "We will rebuild Notre-Dame because it is what the French expect." Construction of Notre-Dame began in the 12th century. Around 400 firefighters battled through the night to control the flames, declaring only at around 10 am on Tuesday that it had finally been extinguished. "Now we're in the phase of investigating," fire service spokesman Gabriel Plus told reporters. A public appeal for funds was launched by the privately run French Heritage Foundation to help restore a "symbol of French history and culture". French billionaire Bernard Arnault announced Tuesday that he and the LVMH luxury conglomerate he controls would give 200 million euros ($226 million), after luxury rival Kering offered 100 million euros. "We have everything to be able to rebuild it in exactly the same way," Culture Minister Franck Riester told France Inter radio, adding that the government was looking at ways to encourage donations. Firefighters said the blaze had been extinguished after 15 hours. 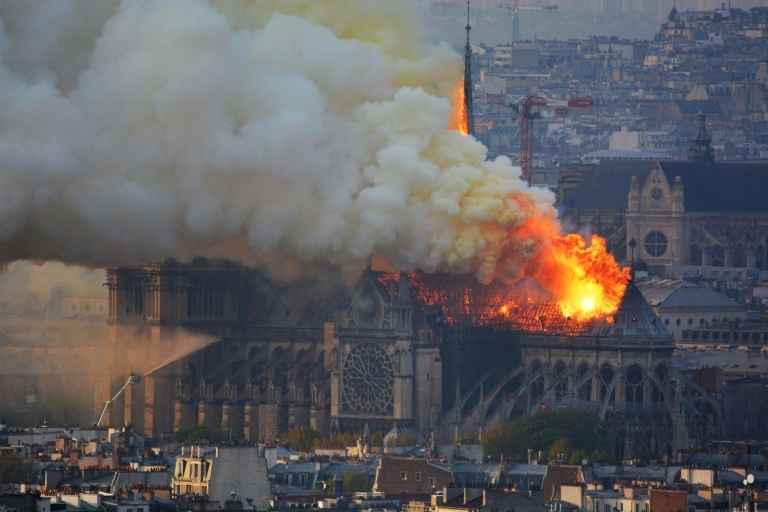 Thousands of Parisians and tourists had watched in horror from nearby streets as flames engulfed the building and officials tried to save as much as they could of the cathedral's countless treasures, built up over centuries. 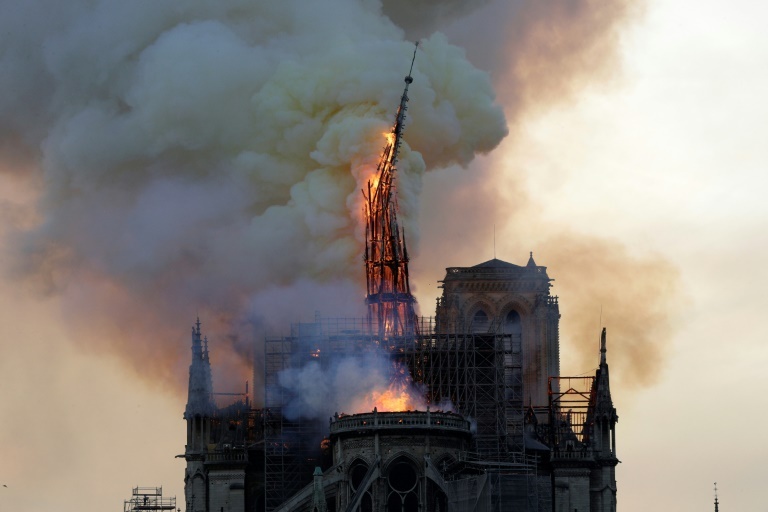 Attention was expected to turn to the source of the fire, which occurred during renovation work to overhaul the spire that had suffered damage inflicted by weather and pollution. Investigators began interviewing witnesses overnight and are treating the case as an "involuntary fire", not arson. Firefighters have said the renovation work could be to blame, and the fire started in an area of the roof that was below scaffolding. 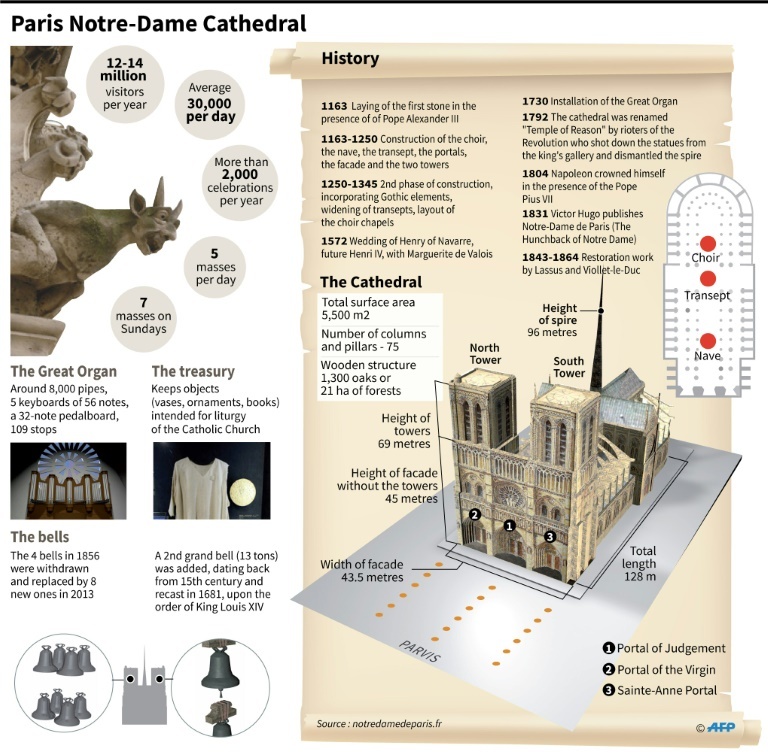 Late on Monday night, to the relief of the nation, Paris fire brigade chief Jean-Claude Gallet had declared that "we can consider that the main structure of Notre-Dame has been saved and preserved," as well as the two bell towers. 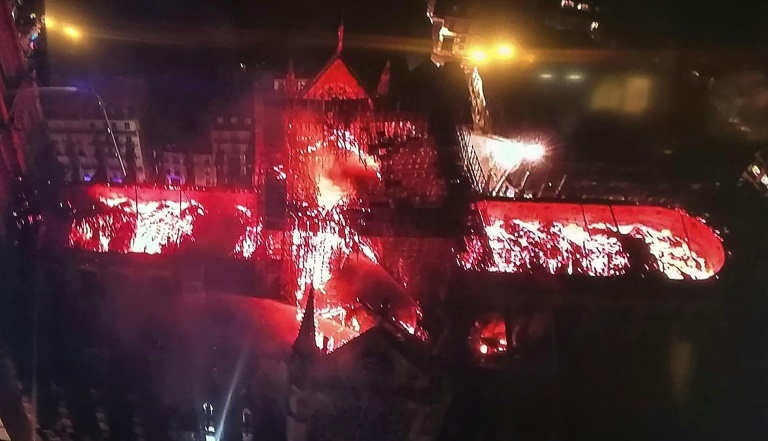 An image taken from a television screen shows Notre-Dame Cathedral engulfed in flames. But culture minister Riester warned that the structure remained unstable and that no one had yet been able to fully inspect the extent of the fire and water damage inside. "We'll have to wait for a while to do a full inventory," he said, adding that the organ appeared to have been "badly damaged" as had many paintings and frescos. The Holy Crown of Thorns and a sacred tunic worn by 13th-century French king Louis, two irreplaceable artifacts, had been rescued along with the church's main crucifix, and placed with others at the Paris town hall. 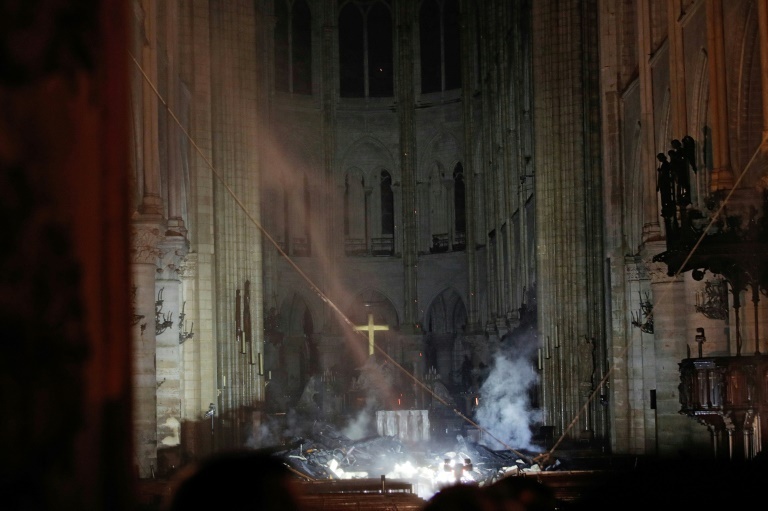 Smoke rises in front of the altar cross as Notre-Dame Cathedral in Paris burns. During the French Revolution in the 18th century, it was vandalised and plundered, but would go on to feature as a central character in a Victor Hugo novel published in 1831, "The Hunchback of Notre-Dame" which is credited with helping save it. The Vatican expressed its "incredulity" and "sadness" over the fire.